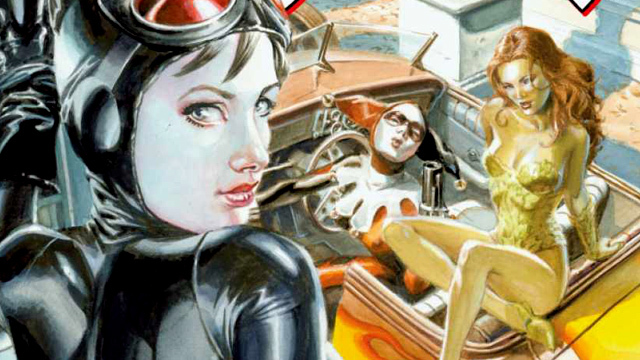 David Ayer and Margot Robbie are reteaming for a Gotham City Sirens movie! There’s some exciting news regarding the future of DC Comics on the big screen, as The Hollywood Reporter brings word that Suicide Squad‘s David Ayer will helm a Gotham City Sirens movie with Margot Robbie‘s Harley Quinn front and center. As previously reported, plans for the film will bring in female DC Comics characters. If the comic book title of the same name is any indication, we’re likely to see new big-screen versions of Catwoman and Poison Ivy. The trade report also indicates that plans for a Suicide Squad sequel are still underway as is a spinoff film centered on Will Smith’s Deadshot. The Gotham City Sirens movie will be scripted by Geneva Robertson-Dworet. Her recent work includes the upcoming Tomb Raider (starring Alicia Vikander as Lara Croft) and Sherlock Holmes 3 (set to feature the return of Robert Downey Jr. and Jude Law). Although no release date has been set, the project is said to be on the fast track at Warner Bros. The next DCU film to hit theaters is Patty Jenkins’ Wonder Woman. It arrives June 2, 2017, followed by Zack Snyder’s Justice League movie on November 17. Other confirmed release dates include James Wan’s Aquaman on October 5, 2018 and a Ben Affleck-directed Batman film (tentatively titled The Batman) in 2019. Ayer’s Suicide Squad, released this past August, has grossed more than $745 million worldwide. Margot Robbie will executive produce the Gotham City Sirens movie alongside Ayer. Jon Berg and Geoff Johns, meanwhile, are producing. What characters do you want to see in a Gotham City Sirens movie? Let us know in the comments below!